When producing bending tempered glass or bending heat strengthened glass, first heat up the float glass to make it bend and moilding, then use specialized equipment to cool it quickly. Features: With good function of safety, shock resistance, thermal stability like horizontal tempered glass, better resistance to breeze strength and better rigidity performance than horizontal tempered glass, it is safe glass. Application: Bending tempered glass is applied extensively to cambered glass curtain wall, lighting ceiling, visiting elevator. Range of products: Different colored float glass, different colored coated glass, Low-E and composite hollow glass, sandwich glass, cambered glass, partition indoor, glass guardrail, interior decoration furniture etc. Big Bend Size C bend - 2000x3660mm , Min.Radius:850mm, thickness: 5mm-19mm, it is mostly used for architecture. Mid Bend Size B bend - 1000x2000mm,Min.Radius:450mm, thickness: 5mm-12mm, it is mostly used for architecture and bathroom. Small Bend Size 750x1500mm,Min.Radius 390mm, thickness: 3.2mm-8mm, it is mostly used for household appliance. Glass Thickness 3mm, 4mm, 5mm, 5.5mm, 6mm, 8mm, 10mm, 12mm, 15mm,19mm, 22mm, etc. 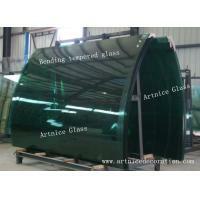 Fencing glass in buildings, hotels, swimming pool , stairs, etc. Our company philosophy: Do products professionally, create value for customers with excellent products, and help customers become bigger and stronger. Our company has over 25 years experiences in this field. The services we offer are field survey, design, produce and field installation. We provide one-stop solutions and customized products. We have very professional engineers to design our top products, control the cost, and provide customers with cost-effective products. We follow professional quality control in every production procedure, in order to ensure that every product is highly qualified. So we can provide top products of high quality and low price. 1, Own factory : We have our own factory. Products would not go through any dealer. Better quality control & lower price .